Syringomyelia is a disease that is identified when fluid-filled cysts also termed syrinxes form inside the spinal cord. These cysts can expand over time damaging the spinal cord and injuring nerve fibers that carry vital information to the brain and from the brain to the rest of the body. Syringobulbia is a term that is used to describe Syringomyelia when a cyst affects the brain stem. The brain stem controls heart rate, breathing, blood pressure, and temperature. Syringomyelia is diagnosed beginning with a comprehensive medical history, family history, and a physical exam with a neurological assessment. MRI (Magnetic Resonance Imaging) is the best test to diagnose Syringomyelia. The decision to use contrast dye is up to the ordering physician. Contrast dye can enhance images making pathology clearer to visualize. A dynamic MRI may be ordered to look at the flow of cerebrospinal fluid and to check for any obstructions. The Radiologist is important in the diagnostic process to measure, document, and report all syrinxes identified on the MRI images to the ordering physician. Prompt reporting aids in expediting proper referrals and treatment. Is there a cure for Syringomyelia? There is no cure at the present time. However, we are advocating for continued research for a cure. What are the symptoms of Syringomyelia? The symptoms of Syringomyelia can directly relate to the location of the syrinx inside the spinal cord. Symptoms can include moderate to severe pain, headaches, stiffness in the back, shoulders, neck, arms, and legs, progressive weakness in the arms and legs, difficulty with balance, numbness/tingling sensations, loss of sensitivity to hot and cold, loss of bladder and/or bowel control, and sexual dysfunction. You may also view our complex symptom chart relevant to Chiari and Syringomyelia that is available on our website. We are working hard to involve all specialties of care in the treatment of Syringomyelia because it is complex and can affect multiple body systems. Prior to this year, Neurosurgery and Neurology have primarily been in charge of caring for the patient with Syringomyelia. However, we now know that multiple specialties are needed beginning with Primary Care/Pediatricians, Neurology, Neurosurgery, Neuro-opthalmology, Cardiology, Pulmonology, Orthopaedics, Gastroenterology, Endocrinology, Urology, OB-GYN, Pain Management, and Psychology all have an integral role in taking care of someone with this disease. Treatment for Syringomyelia is individualized. Options for treatment include ongoing monitoring for presence of symptoms or signs of progression. Monitoring is important by the patient's primary care in collaboration with the neurosurgeon and all specialties for best outcomes. Another option is surgery. Surgery may be recommended when a patient is symptomatic or having early progression. The goal is to restore the flow of csf flow around the spinal cord and decrease tension on the spinal cord. Proper treatment/intervention is best at an early phase to prevent permanent damage and further complications. Congenital Syringomyelia- (communicating SM) -in many cases SM is caused by a Chiari Malformation. Chiari Malformation is diagnosed when brain tissue extends through a hole at the bottom of the skull called the foramen magnum. This tissue extends into the spinal canal and obstructs the flow of cerebrospinal fluid. Hydrocephalus may be found with congenital SM. Arachnoiditis and scoliosis may be present as well. Acquired or Primary Spinal Syringomyelia-causes can include meningitis, spinal cord injury, tethered cord, a spinal tumor, arachnoiditis, and hemorrhage or bleeding into the spinal cord. Men, women, children, and animals can be born with or develop Syringomyelia. It can affect anyone! How many people are currently affected by Syringomyelia in the world? We do not have current numbers of individuals diagnosed with Syringomyelia. We are diligently working on a way to find out! 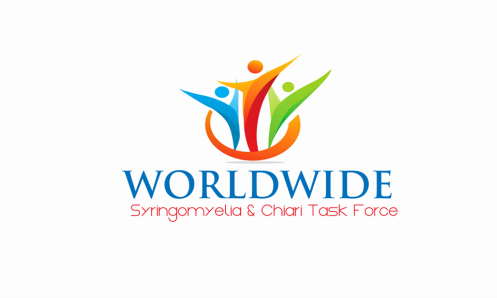 We are launching the first WSCTF Syringomyelia and Chiari Worldwide Registry for pediatrics and adults to lead a natural history study about how the disease affects an individual on a day to day basis. What is the treatment for Syringomyelia at this time? At the current time, Syringomyelia and Chiari are monitored by a neurosurgeon for any signs of progression or changes. The primary care physician and pediatrician can help monitor the patient and provide prompt referrals back to neurosurgery and other specialties when needed. Treatment includes careful monitoring of symptoms, assessment, and at times surgery may be recommended. Our organization is working on a program called the Specifics of Syringomyelia Project (SOS Project) to help us develop universal guidelines for better treatment of Syringomyelia in direct care for use worldwide! How do I file for disability? Prior to filing for disability it is important to consider all options and it is not to be taken lightly. The decision to file for disability should be discussed with your loved ones and your treating physician. It may be best to consult an attorney before taking any action. You can find additional assistance regarding the application here: www.ssa.gov/disabilityssi.